When you’re searching for an easy recipe to take to a potluck or to serve for Sunday lunch, this recipe is an easy go-to one. There is no last-minute stirring and mixing because it will have been done three hours earlier. 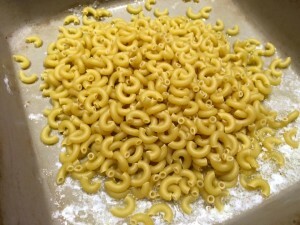 You can choose your style of macaroni; I usually use elbow macaroni, but that’s entirely up to you. 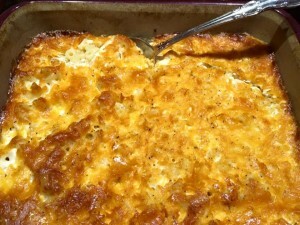 You’ll need butter, milk, shredded cheese (or Velveeta), and Salt and Pepper. Oh yes, you’ll need three-plus hours of time before it’s ready to serve. How easy is that? Start by melting the butter in the pan you’ll be using (which depends on how many batches of this you’ll be making). 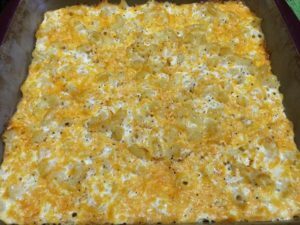 For one recipe, I use a 9 x 9 casserole dish. 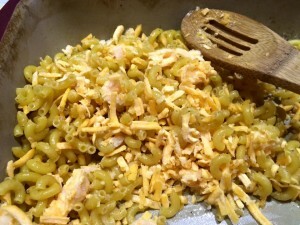 Melt the margarine in the bottom of the pan, then add your dry macaroni and salt and pepper. If you’re a garlic or onion fan, you can toss some powder or the real stuff in there. Mix it together. Add your cheese and mix it well. This is where I don’t quite follow the directions. It says to add the milk and not stir it, but I do (just a little). Put the pan into a pre-heated oven set at 235. Cover it and bake for three hours. I really like the Lily pad covers I have. I prefer these to foil wrap because they are reusable, are dishwasher, stovetop, and oven safe. This one doesn’t quite fit the corners, but it still works. I have a rectangular one I could have used, but it is quite a bit larger than this pan. The finished product. I like to use this dish when I am using canned beef heated in a skillet. A dish of green beans and a red congealed salad (or some applesauce) tops off the meal. 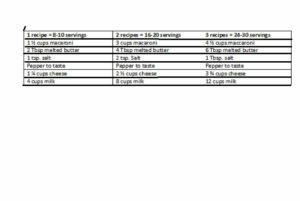 This chart is helpful if you want to double or triple the recipe. 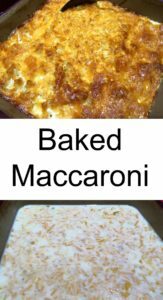 An easy recipe for baked macaroni - easy to mix, simple to bake, and filling to serve. 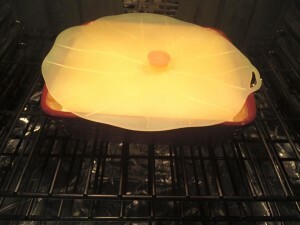 Melt margarine in bottom of 9 x 9-inch pan. 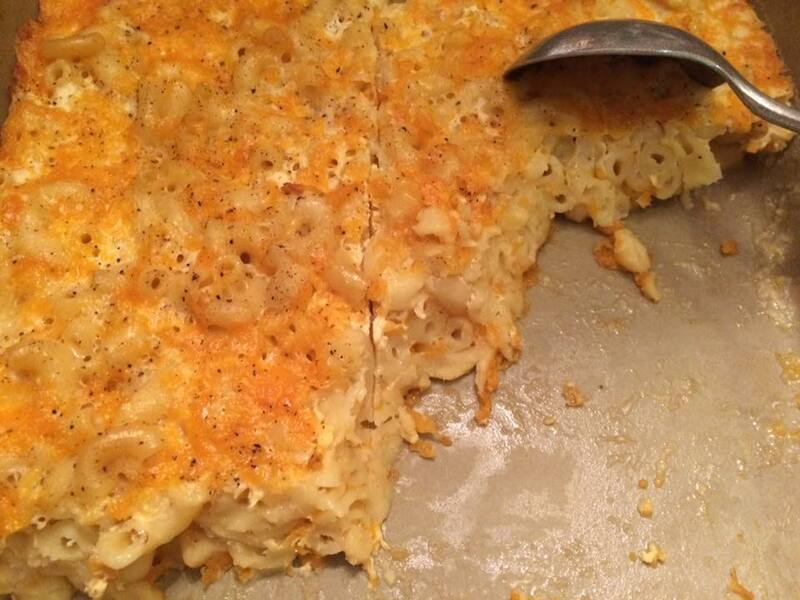 Add macaroni, salt and pepper, and stir. 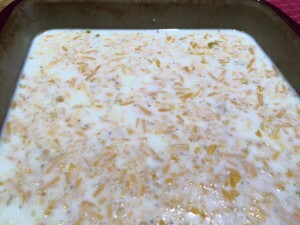 Mix in cheese and milk. Cover and bake at 235 for 3 hours. One thing I love about Amazon is the free shipping. You can have these lids at your house in short order. I have never regretted purchasing these. 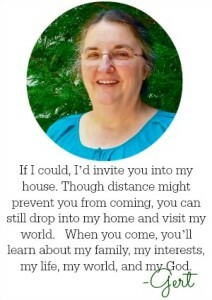 I don’t think you will, either.